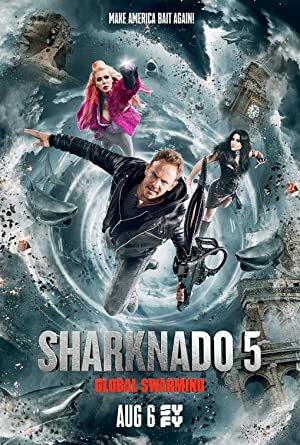 Sharknado 5: Global Swarming (2017) – What's New on Netflix Canada Today! As shark-infested storms grow stronger and more complex, the world braces for the inevitable – a global sharknado. This year, the mission gets personal for chainsaw-wielding leader Fin Shepard and his bionic wife, April, when their young son gets trapped in a sharknado and is transported all over the world. Attention flying sharks! This is your fifth — but probably not final — warning. Fin Shepard and his family are gunning for you.